19th century oleograph with the Passion of Christ. It is still hanging on the bedroom wall in a West Norwegian farm house. Passion clock, painting c. 1730, Western Norway; now in the church at Vassenden, Indre Sunnfjord. NK743 Devotional oleograph showing the life of the Virgin Mary centred around the Virgin pointing to her heart. The provenance is most likely a Danish farm house on Stevns, Sjælland. Together with a similar composition on the Sacred heart of Jesus, in the same size, it is since 2006 in the collections of the University Museum of Bergen. The picture shown here (left) is simply such an oleograph showing Christ carrying his cross and exhorting the beholder to take up his or her own, as one could read in the Gospel of Saint Matthew. Arranged around the central figure and inscribed in a crown of thorns are 14 small circles, each showing a scene from the Passion, beginning with Christ before the high priest Caiaphas and his Entombment. 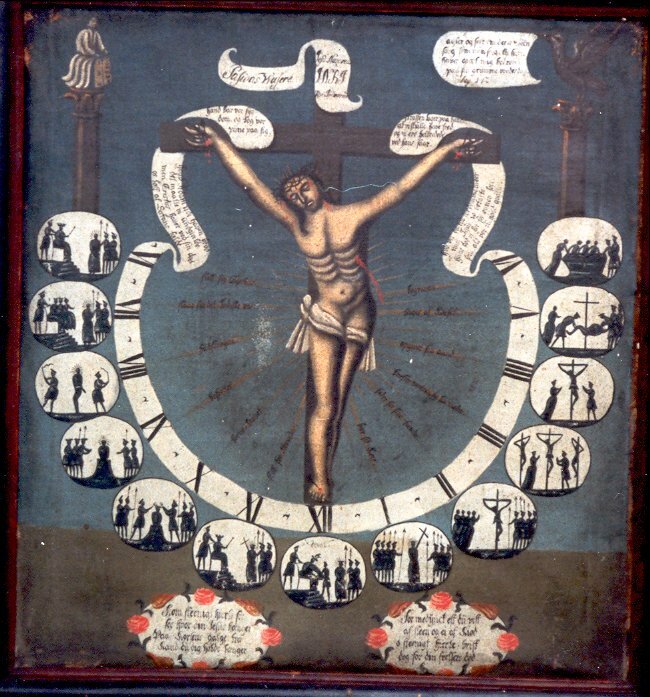 This is a late 19th century version of the Pietistic Passion Clock decorating so many Norwegian church interiors around 1730. This again was a Pietistic version of the Catholic ‘Way of the Cross’, collecting in one motif the medieval devotion where one moved from station to station, each with a scene from the Passion. In 1731 pope Innocence XIII fixed their number to 14. In 19th century Christiania (today Oslo) a Catholic priest, J. C. Lichtlé, had to defend himself, being accused of having lured a Norwegian woman, a Mrs. Solaas, into becoming Catholic. Proof was the considerable number of seemingly Catholic religious pictures in her flat, not least several depicting the Virgin Mary. The priest defended himself in a pamphlet published in 1858, rejecting such images as proof and instead admonishing his enemies to travel around in Norway, visiting churches and ordinary homes. ‘ By no means is it rare in Lutheran homes to find images of the Madonna and of saints’, he stated, ‘even with French inscriptions’. He was probably right – such pictures, with an obvious Lutheran provenance, still turn up regularly. 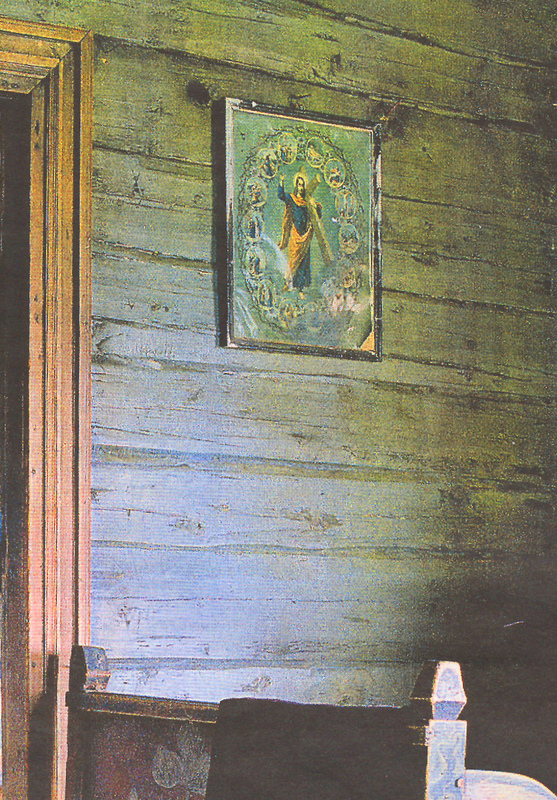 To underline what father Lichtlé had stated back in 1858, one may point to a pair of such openly Catholic, possibly French, oleographs, which around 1900 were placed in a Danish farmhouse in an area as Lutheran as in Western Norway. 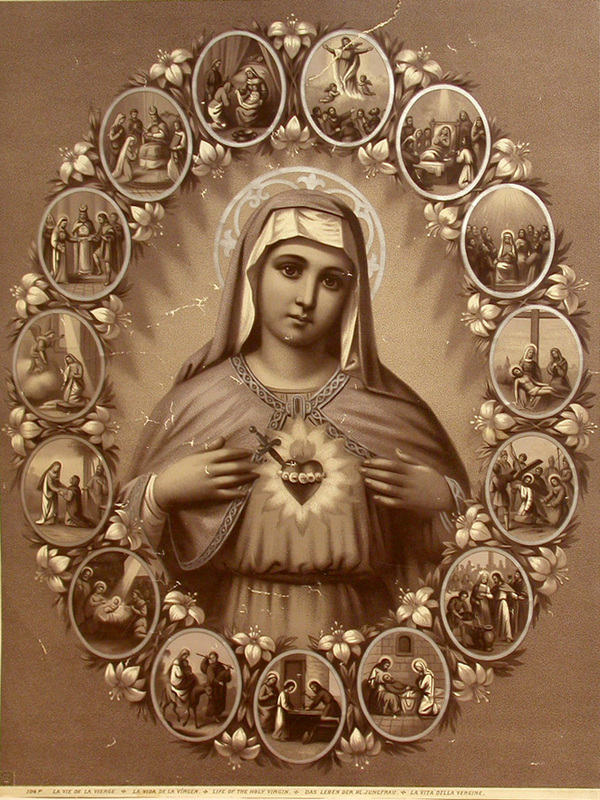 One showed the Sacred Heart of Jesus, which might be acceptable in the perspective of an existing Pietist tradition, the other, however, exclusively Catholic, focusing on the Virgin Mary: Her holy heart and life from birth to her Assumption (right image). Yet even such a motif found its place in the religious decoration of the home of Lutheran peasants in Denmark. Obviously, the Catholic church did what it could to provide the imagery necessary for a devout Catholic environment. In no. 23 of Nordisk Kirketidende for katholske Christne from the year 1879, p. 359, one finds an advertisement inviting Catholics to subscribe to a magazine scheduled to appear every second week. If quick about it, the subscriber would receive 3 oleographs (otherwise sold for 50 øre each). The motifs were: Jesus wearing the crown of thorns, the Virgin Mary, and Jesus consecrating bread and wine. All these motifs, often probably the same pictures (like inv.no. NK 743 above), were frequently found in the homes of good Lutherans in Denmark and Norway.